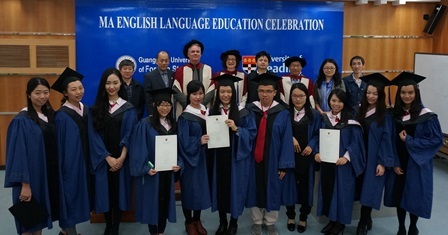 Senior academics from the Institute of Education have travelled to China to see students graduate from the University of Reading MA (English Language Education) programme at Guangdong University. Addressing the new graduates, Head of Institute Professor Andy Goodwyn urged them to make full use of their new knowledge and skills. He added that through their shared experience, they will have gained not only a piece of paper with their degree certificate, but also a depth of knowledge and friendship with teachers and students that would be a foundation stone for their future. Professor Goodwyn has worked hard with his counterparts in China to link the two universities across the continents, resulting in the 2013 launch of the MA programme. Increasing numbers of students from many different provinces of China enrol each year and there has been great enthusiasm and commitment from all sides. 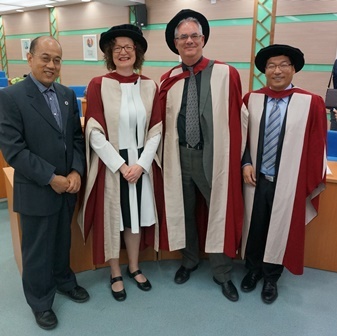 This year’s graduation was a happy celebration, presided over by Dr Wang Yunfeng, Programme Director (Academic) (GDUFS). The University of Reading is ranked as one of the UK’s 20 most research-intensive universities and is in the top 1% (ranked 176th in 2012) of universities in the world. The University has a particular strong tradition in applied linguistics and language education. It was on the Advisory Board for the development of Chinese College English Test (CET) Band 4 and Band 6 and has been supporting English language teaching in China over the decades. The IoE is one of the largest and leading providers of teacher education and educational research in the UK. Many of its graduates soon become leading figures in their respective schools. The Faculty of English Language and Culture, Guangdong University of Foreign Studies, is renowned both nationally and internationally for its research in linguistics and applied linguistics. It is the only nationally designated Research Centre for linguistics and applied linguistics in China. It leads South China in the research of foreign languages and cultures, overseas economy, trade and international strategies.